This functional, busy chapel sits on the edge of the Heartsease estate on the eastern side of the city. These days, the Baptists are one of the three major Churches in England, third in size in terms of their congregations only to the Catholics and the Anglicans, while other non-conformist denominations seem to be rapidly falling away, of which more in a moment. Of course, the Baptist tradition has always been a strong one in East Anglia, particularly in Suffolk, and particularly in rural areas. In the 19th Century, Baptist chapels would attract huge crowds, but TCB Timmins, in his commentary on Transcripts from the 1851 Census of Religious Worship, makes the interesting point that, while the Baptists already had more non-conformist chapels in East Anglia than any other denomination, they were mainly based in rural areas, and the Baptist chapels in towns generally had smaller congregations than other chapels. Timmins suggests that this may be because urban populations tended to be more liberal, and the 'Strict and Particular' strain in East Anglian Baptist theology was more attractive to the rural poor. 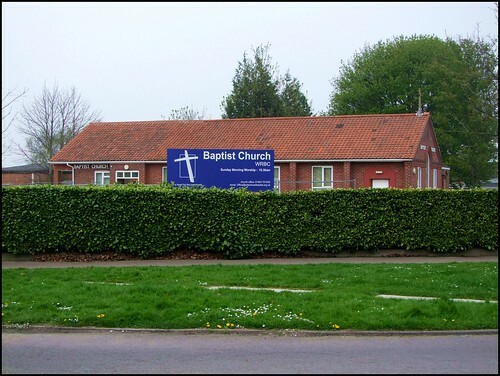 Be that as it may, by the middle of the 20th Century the Baptist movement had a strong foothold in Norwich, and when the post-war estates were built churches were planted from existing communities, including this one, which opened in 1960. The frontage on Witard Road is simple and clean, with red brick offsetting a tall arched window, and a rather precarious stone cross above. The building is surprisingly long, and yet, like most urban Baptist and Catholic churches, it is no longer really big enough for all the people who want to worship there. The homely building belies the fact that, rebadged as WRBC, the community presents itself as one of the more go-ahead Faith communities in the city. There are two main strands in Baptist theology, one more outward-looking and liberal than the other, and it is these more evangelical liberal churches which are experiencing the growth and development in urban areas. Christianity is, of course, a tremendously intellectual and complex religion. The great virtue of the modern Baptist churches is that they are able to present it as simple, and in so doing make it attractive to people responding to 'the God-shaped hole in all of us', people who may have resisted and rejected the Churches in which they were unwillingly brought up. Roger Scruton, in England: an Elegy, observed that, in urban 19th Century England, Nonconformism was not merely a religious protest. It was a protest against the Anglican vision of England, as an Arcadian landscape enchanted by its law and institutions, and made holy by ritual and prayer. For what relevance did this vision have, to those who had fled the countryside where they had been threatened with starvation, to the great, bleak smoke-filled cities where nothing was promised except a wage? But when the Anglican Church lost sight of its sacramental character, began to play with 'Alternative Services' and camp-fire hymns, permitting divorce and remarriage and trivialising its communion, the Non-Conformist Churches vanished over night. What Scruton is suggesting, of course, is that the non-conformist Churches of England filled a need that no longer exists, and broadly speaking he is right - except in the case of the Baptist movement, which continues to go from strength to strength. As the Church of England slowly sinks out of sight, and Christianity in this country realigns itself between Catholic and Protestant poles, it is fascinating to ponder that the liberal Baptist tradition of churches like WRBC may well become the mainstream Protestant Church in a country which is increasingly divorced from the enchantment of its past.